On a beautiful day in the Mushroom Kingdom Princess Peach decides to go out for a stroll in the sunshine, As Peach happily skips along little does she know that Bowser accompanied by several legions of his army have just launched a huge assault on the castle. Very quickly Bowser and his army were able to overwhelm the castle guards and even captured Mario, Luigi and Toad with the help of their newfound weapon called the Vibe Scepter. When Peach returns she is immediately snapped out of her happy relaxed state and quickly bought back to reality when she sees her Guards running around the castle in a complete state of pandemonium; some of them laughing, some weeping bitterly and some extremely angry. Mario, Luigi and Toad are nowhere to be seen as Bowser has already made them his prisoners. After a brief moment to gather her thoughts the Princess decides that she will take off looking for Bowser and rescue Mario, Luigi and Toad herself seeing as they've helped her out on so many occasions. Toadsworth handed her an umbrella as she left, he didn't elaborate any further than to say that this was no ordinary umbrella. As the story progresses Princess Peach discovers that the umbrella is named Perry and has his own story to tell... As peach travels throughout the lands of Vibe Island, Perry proves to be a very valuable ally. Ladida Plains - A plain located in the Southern Portion of Vibe Island. The first world that Princess Peach encounters. Hoo's Wood - A wild forest containing many tall trees and lots of plant life located at the Northeast of Ladida Plains (separated by a Lake). The ruler of the land is an Owl called Hoo. Shriek Mansion - Ruled over by King Boo the Shriek Mansion is jam packed with various ghosts including Boo's, Fishin' Boos and Big Boo's. Fury Volcano - An active volcano, in this area there are some caverns that contain smoke which causes progressive damage, but there are more crystals than normal scattered about the levels to refill the players vibes. Cyclones if used carefully can blow away smoke. This area of Vibe Island is ruled by Wiggler. 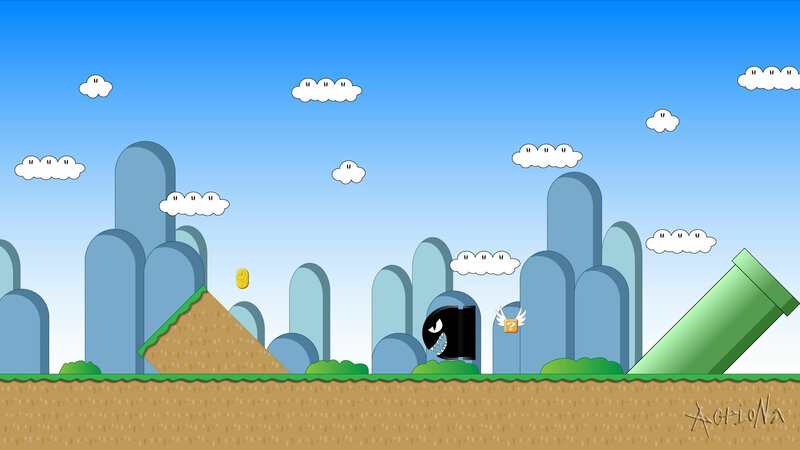 Wavy Beach - The fifth world in the game sees the first appearance of Chain Chomps in Super Princess Peach. Ruled over by a giant Blooper named Gooper Blooper who fills the majority of the screen. Once he is defeated Princess Peach can progress to Gleam Glacier. Gleam Glacier - The icy blizzards of the Gleam Glacier are ruled over by a snow dragon named Blizzaurus; he must be defeated in order to move on to Giddy Sky. Giddy Sky - The seventh land is set in the Sky, and is ruled over by a giant version of Kamek (giant because he cast a spell on himself). This worlds is full of Koopas airforce; Lakitu's, Paragoombas, Amazing Flyin' Hammer Bros and Koopa Paratroopas. There are a multitude of Hot Air balloons in this zone which need Rage to make them float upward - there are sufficient vibe crystals along the way to keep you going. It is in this area that Luigi is being held. 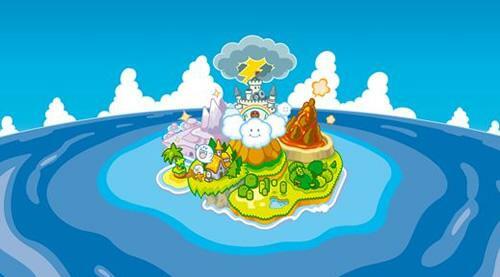 Bowser's Villa - The eighth and final part of Vibe Island is a Villa that Bowser built on Vibe Island. It's more of a heavily fortified castle than a Villa really though - and this is where he is holding Mario prisoner. Peach must defeat the Army Hammer Bro before she can take on Bowser and rescue Mario. 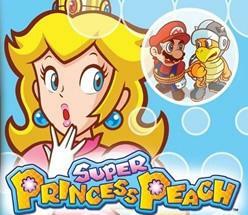 In Super Princess Peach as you play the game you are able to trigger one of four "Vibe" abilities. In order to activate a vibe, Peach needs to first have enough energy in the Vibe Gauge (top left of the Nintendo DS screen just beneath the health meter). There are four different coloured hearts each representing the vibes. Orange/Yellow heart will activate the Joy vibe which makes peach very happy and able to float around by pressing A; once the A button is released Peach will perform a cyclone move which could have uses like getting rid of Smoke in the volcano stage for example. This floating ability helps Peach to reach Toad's which would otherwise have been inaccessible. Dark Pink heart; when this vibe is active Peach becomes extremely angry and catches fire. She is invulnerable to enemy attacks while this is active and when she jumps all nearby enemies will be stunned when she lands, this hard landing will also set off big switches. Blue heart activates the Gloom vibe which causes Peach to become very sad and cry. The plus points are that in this Vibe Peach can run quicker, and her tears make plants grow quickly to enable her to climb them. Her tears also make water wheels go around which can open hidden areas of stages. Green heart activates the Calm Vibe; Peach will become very calm restoring HP until the Vibe gauge is empty or her HP is full. This process can be interrupted if Peach is attacked by an enemy.